Contact Chermaina Roundtree, AMAC Programs & Corporate Development Director, at croundtree@amac-org.com or 703.414.2622 x105 regarding sponsorship availability. Reach thousands of eyes in just one location. Gain visibility and connections that help you do business with some of the best and innovative companies and organizations in the aviation industry. 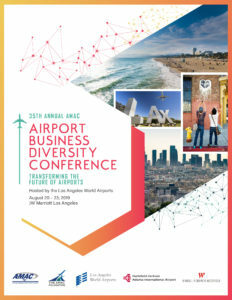 The exposure your brand will receive reaches far beyond the venue, with AMAC’s robust, broad-based media strategy that reaches national, regional and local audiences with news, insights and details about the upcoming conference's value to the aviation community and to the community in which the conference is held. Showcase your capabilities and demonstration of capacity. Get enhanced visibility and access. Review the wide selection of sponsorship packages and select the one that's right for you. Custom sponsorship opportunities are also available. Don't miss this valuable opportunity to set your company apart!